Once a week, at work, we order food and have it brought in for office meetings. To try to break the monotony, we always try to switch it up and try new restaurants in the area. It’s both fun, and stressful, trying to choose different restaurants and making sure there was something on the menu that everyone in the office would enjoy. One day, when we were brainstorming ideas for new restaurants, someone in the office came up with the suggestion for a restaurant that wasn’t too far away from our office. Unfortunately, timing didn’t work out for us to order food from this restaurant for our next office meeting, which was a bummer because the menu seemed quite intriguing. But after talking it over, we all decided that since we couldn’t bring food from the restaurant to us, we’d go out one day and have lunch at the restaurant instead as a group. 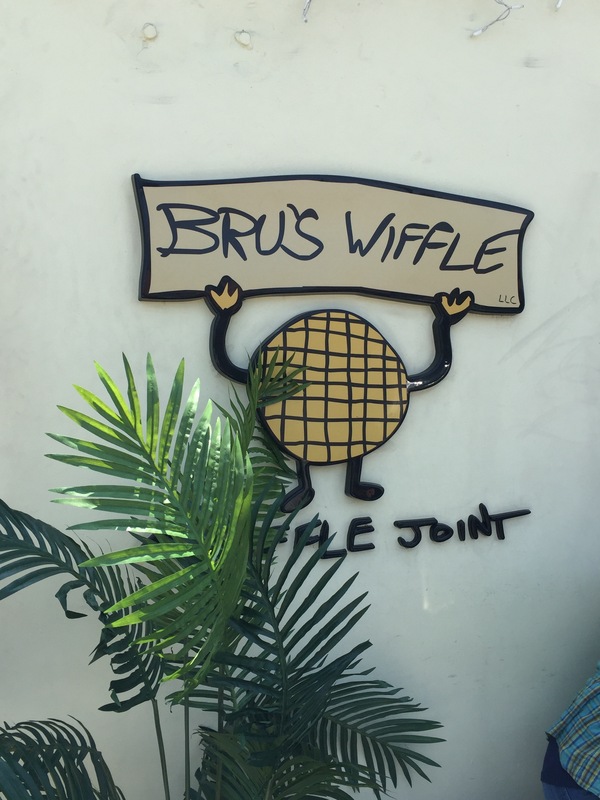 Bru’s Wiffle – A Waffle Joint, as the name may indicate, specializes in the art f the waffle, not just for breakfast, but as a savory item for lunch and dinner and as a sweet item for dessert. With two West LA locations in Beverly Hills and Santa Monica, Bru’s Wiffle takes the Belgian waffle and elevates it with unique and interesting flavor combinations. But Bru’s Wiffle isn’t just about waffles, they also serve up a tasty selection of salads, burgers and more. At the Santa Monica location, which features both indoor and outdoor dining, breakfast and brunch are quite popular and you can always see people filling the outdoor dining tables to get their hands on the amazing, made-from-scratch food served at Bru’s Wiffle. 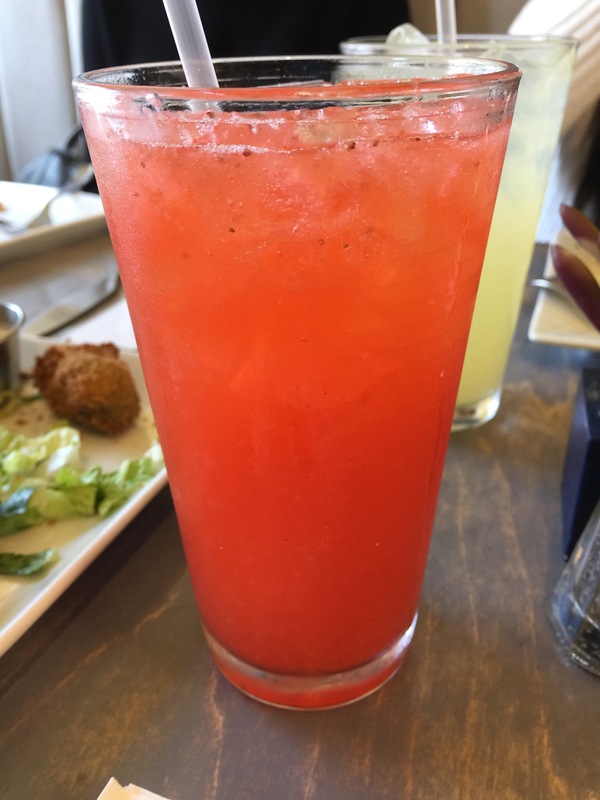 I started by ordering a glass of the fresh squeezed strawberry lemonade. We were dining there on a Friday for lunch, and while we weren’t sitting outside, it was still quite warm and a glass of strawberry lemonade just sounded refreshing. And it seems that you can’t go wrong with homemade lemonade, add a little bit of strawberry puree, and you’ve got a cool, slightly tangy, slightly sweet and very refreshing drink. As a group, we decided to order a couple of different appetizers to split. 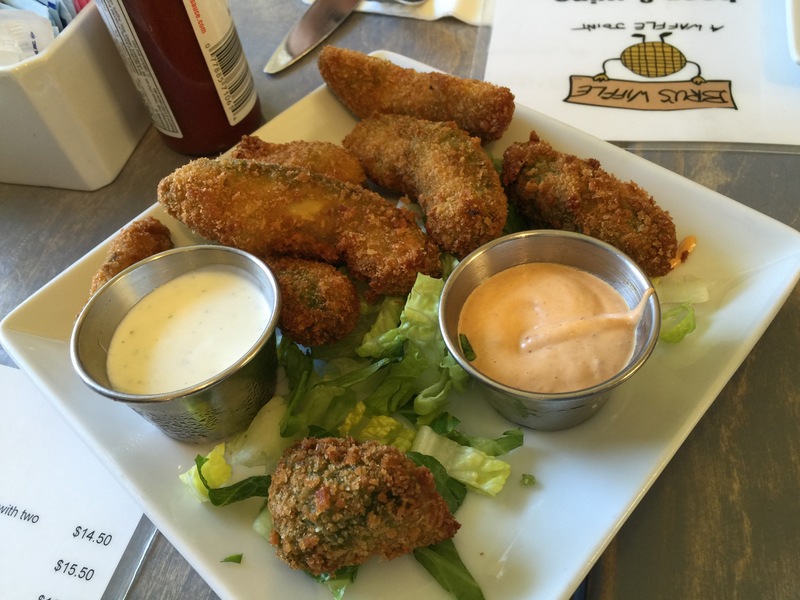 First off was avocado fries. This was just so different and unusual, we wanted to see what it was all about. Served with options of an aioli or ranch dipping sauce, avocado fries are exactly what they sound like. Wedges of ripe avocado are battered and then deep-fried into a crispy, golden brown avocado fry. It sounds odd, and looks a little weird, but one bite into the a fry and its tasted amazing. The avocado fry was super crispy and crunchy on the outside, and cool and creamy on the inside. The combination of the crunchy and the creaminess was different and unique and little bit addicting. This is a combination I’ve never seen before, nor would I ever have thought would work, and yet somehow, it works perfectly. We also got an order of cheesy bacon fries to share as well. French fries topped with melted cheddar cheese and bacon bits and served with a side of ranch dressing and ketchup. This is one appetizer that you can’t go wrong sharing with a group of people. 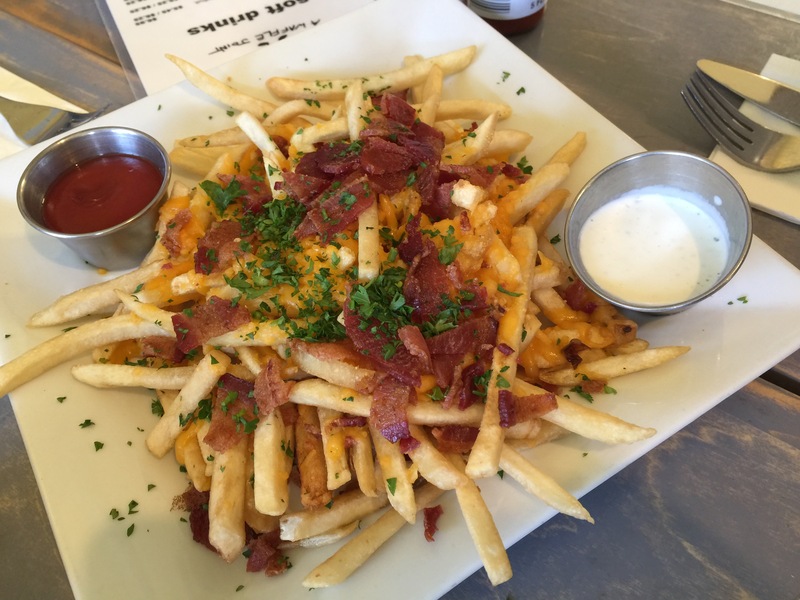 After all, who doesn’t like fries with melted cheese and bacon? Bacon makes everything better. The cheddar cheese was mild in flavor which allows the fries themselves to shine through and not be overwhelmed by the cheese. The fries were nice and crunchy and still tender on the inside and there was actually a good number of bacon bits so that you weren’t searching for the bacon. Alright, I know we were here for lunch and that Bru’s served salads, and savory lunch waffles and what not, but I couldn’t help myself and I actually ordered a dessert waffle for my lunch meal. That’s allowed, right? I ordered the banana split waffle. The banana split waffle is a Belgian waffle topped with ice cream, whipped cream, sliced bananas, strawberry quarters and then topped with chocolate sauce and dusted with powered sugar and served with a side of warm maple syrup. It’s decadent and heavenly all rolled into one large Belgian waffle. I just couldn’t resist the appeal of banana and strawberries and chocolate sauce. Add in the ice cream and the whipped cream and that’s like icing on a cake. Also take into account that I’m a sucker for Belgian waffles in general, and this was always going to be my choice, no matter what time of day. I have no shame. Admittedly, when the waffle arrived at the table, it appeared huge. This would be an appropriate waffle to share with someone else for dessert. But since this was my lunch, I was going to do my best to finish it, and it was so good that ultimately, I had no problems finishing the entire waffle. The addition of the warm maple syrup was amazing, the combination of the cold, creamy ice cream in combination with the warm Belgian waffle and the warm maple syrup was scrumptious. 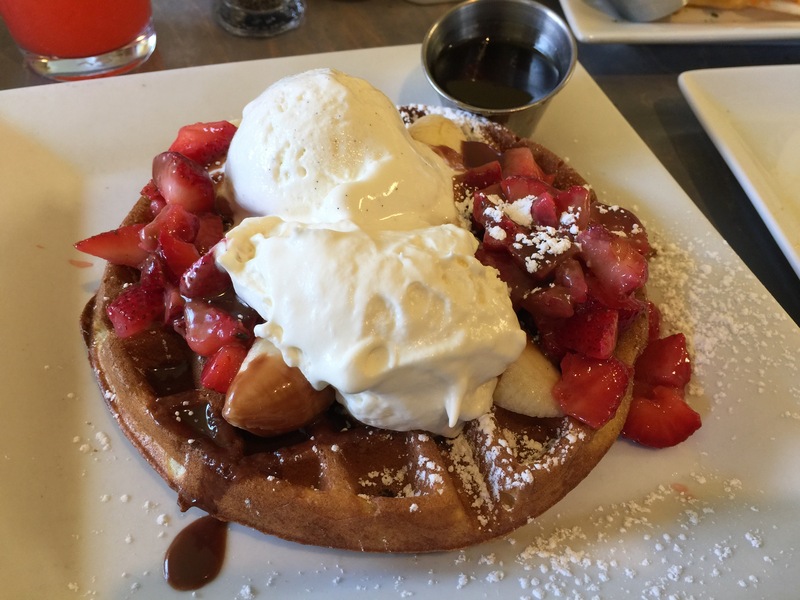 We haven’t even talked about the sweetness of the bananas and the strawberries, and believe me the waffle was loaded with fruit, which was fantastic. The chocolate sauce was also sweet and the creaminess of the whipped cream and the whole dish just came together. It was so sinfully delicious and I savored every single bite of this banana split waffle. I think our office outing for lunch at Bru’s Wiffle – A Waffle Joint was the first office outing out of the office we’ve done in quite a while. The atmosphere at Bru’s Wiffle was perfect for us to just hang out and enjoy each other’s company while enjoying some good food too. Everyone was able to find something on the menu to satisfy their hunger from gourmet salads, to burgers, to savory and sweet waffles. I was pleased with the creativity and variety of the menu. 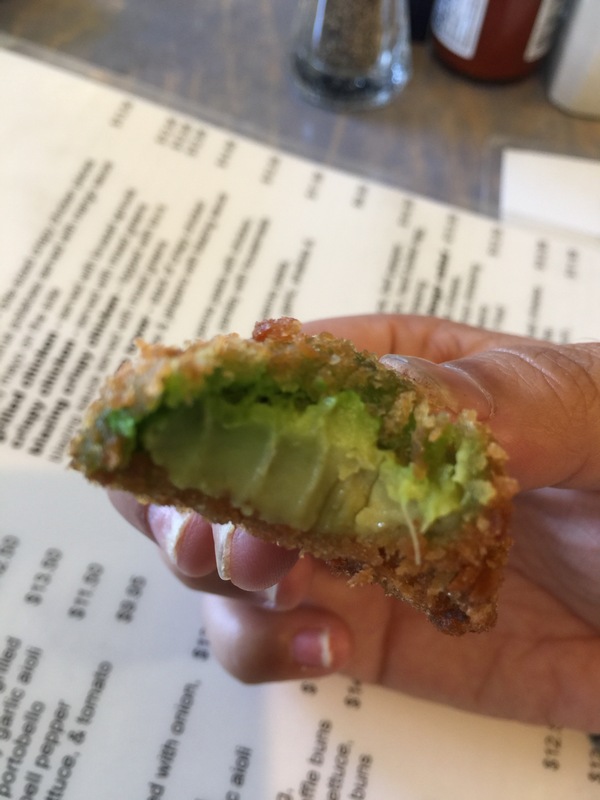 Avocado fries were different and unique and we all enjoyed them. And my banana split waffle for lunch blew me away with how delicious it was. I’ll have to convince my husband to take me back there for a brunch or lunch again in the future.